It’s not difficult to make a good plate of nachos. But a great plate of nachos requires skill. It’s not difficult to make a good plate of nachos. But a great plate of nachos requires skill. 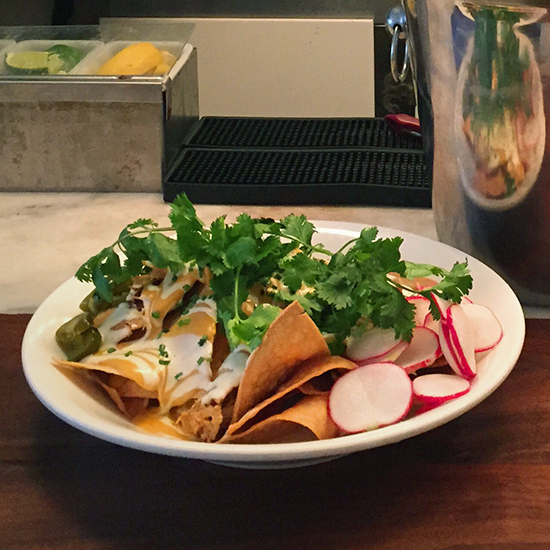 Chefs Dennis Spina and Homer Murray of Brooklyn’s River Styx have proved their nacho prowess with their much-lauded plate of house-made tortilla chips, gooey stadium-style cheese, braised chicken and silky crema. It’s a piece of cheesy, crispy, alcohol-absorbing art—a dish that straddles some heretofore undiscovered line between precise haute cuisine and sloppy bar food. Here, the chefs share their expert nacho knowledge. Crema needs mayonnaise. At River Styx, the chefs make the crema with sour cream, lime juice and mayonnaise. “It’s a flavor conductor,” says Murray. “It makes things taste better.” But not just any mayo will do—the chefs opt for Kewpie. “It’s a special kind of flavor conductor,” Spina says.